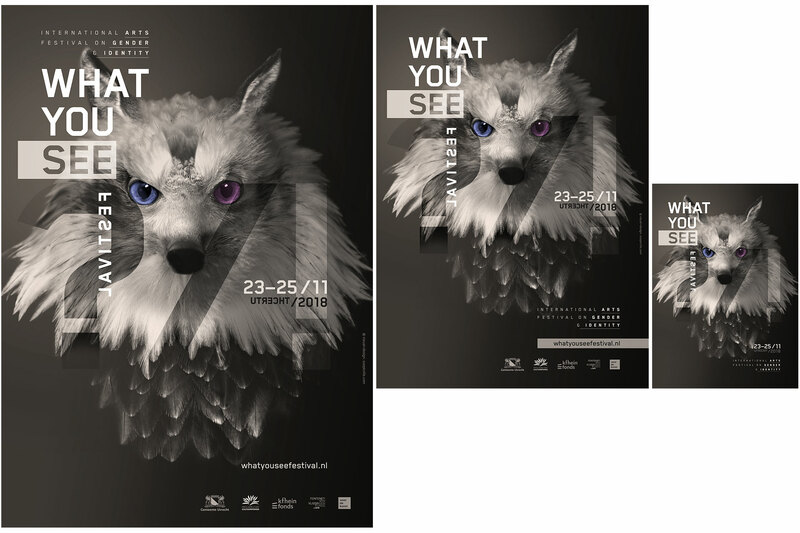 What You See is a brand new, contemporary and international arts festival on gender and identity in The Netherlands. Through dance, theatre, visual art, film, music and enlightening conversations the richness and beauty of diversity will be celebrated. What You See is not about finding clear answers, but rather proposes a search to broaden deep ingrained norms and undermine premises on femininity and masculinity. Female/male, black/white, old/young, gay/straight, something in between or not any of those classifications: everyone is welcome to be confused and/or amazed and to experience some unforgettable works of art and beautiful encounters. 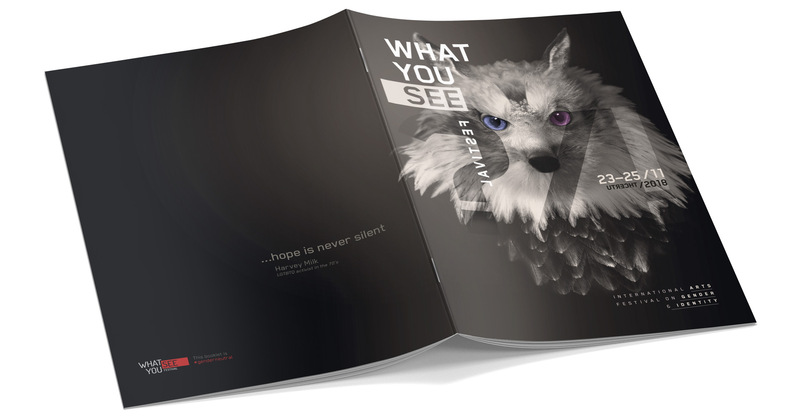 For its very first edition in 2018 Soopknife was invited to create the campaign visual, posters and the cover for the printed booklet. 2018 Launch Campaign: (What) do you see ?/! A campaign visual that the viewer takes for granted on first sight was what I was after. You assume you know what you see, but is that the reality? What is it? What gender? Which category? What? Who? How? And who is watching and judging whom actually? Avoiding human figures as they will almost automatically adhere to norms, get categorised and therefor also automatically exclude people, I combined elements of different animals to form a new creature with a confronting look, a little headstrong, but still with a level of cuteness. Many layers, just like how identities are built and shaped from many layers. Free as a bird, smart like a fox, alert like a deer, powerful like an eagle, resilient like a cat, outcast like a skunk, social like a meerkat and invisibly visible like a zebra. Two differently coloured eyes, baby blue and baby pink: is there anything more gender obvious? As well as a reference to a pioneer in gender freedom and sexuality: David Bowie. Overall feel in black & white, because society classifies black and white. A prominent place yet merging with the image are the typographic characters ? and ! that represent confusion and amazement. © 2019 Soopknife. All rights reserved.